Boeing and Airbus both had a very strong month and delivered 102 and 127 commercial jets in December 2018, respectively, compared to 83 and 127 deliveries in the same month last year. For Boeing this marked a new all-time monthly delivery record, while Airbus tied its own record high set in December 2017. For the full-year 2018, Airbus almost closed its American rival’s lead by delivering 800 jets vs. Boeing’s 806. Airbus was successful in meeting its full-year target, while Boeing narrowly missed its own target of 810-815 deliveries. In 2017, Boeing delivered 763 jets (748 in 2016), with Airbus handing over 718 (688 in 2016). In December 2018, Boeing delivered 69 737s (of which 51 were 737 MAXs), well above the current monthly rate of 52 jets. The company also delivered 11 767s, five 777s, and an impressive 17 787s. On December 13, Boeing celebrated the 787th 787 Dreamliner delivery. Boeing delivered 145 787s in 2018, up from 136 in 2017. During 2018, Boeing raised its 737 production rate to 52 and plans a further increase to 57 737s per month in 2019. 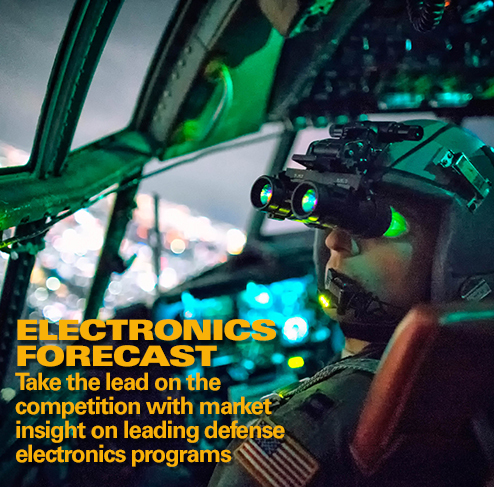 When asked about the potential for a 2020 production hike, Boeing stated in September 2018 that the market can support a production rate higher than 57 per month. A total of 256 737 MAX jets were delivered in 2018, up from 74 in 2017. 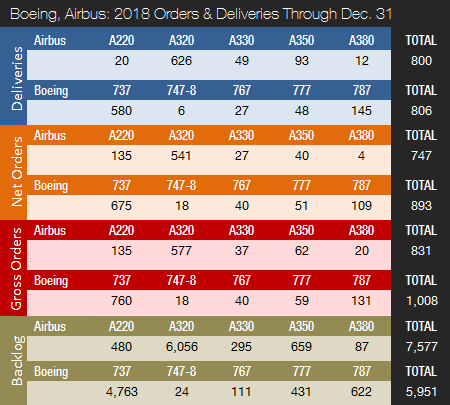 In December 2018, Airbus delivered eight A220s, an impressive 93 A320s (27 ceo / 66 neo), 12 A330s, and 12 A350s. Airbus also shipped two A380s. Airbus performed an impressive comeback in the second half of 2018 after the company was trailing its 2017 deliveries by as many as 19 jets in May. A total of 386 A320neo family aircraft were delivered in 2018, up from 181 and 68 in 2017 and 2016, respectively. By mid-2019, Airbus expects to be delivering 60 A320 jets per month on average. The company has internally been debating rates above 60 aircraft. Airbus delivered 93 A350s in 2018, up from 78 in 2017, and recently increased the monthly production rate to 10. Airbus is considering a further increase to 13 A350s per month in 2019. The ramp-up of A350 XWB deliveries combined with a higher A320 production rate means that the company has almost closed Boeing’s deliveries lead and could surpass its top rival in 2019. With 203 net new orders in December, Boeing had a very strong month in the orders race. Boeing logged 216 gross orders (minus 13 cancellations => net of 203). The company booked six orders for a total of 194 737 MAX narrowbodies, including 125 for a single unidentified customer. 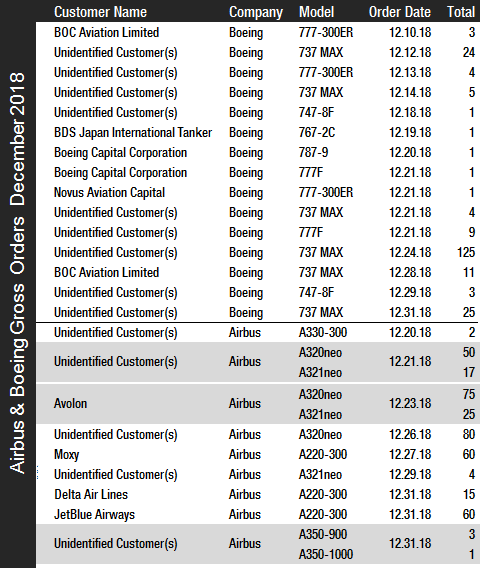 Other December bookings worthy of mention were two orders for a total of four 747-8 freighters, five orders for a combined eight 777-300ERs and 10 777Fs, and a single 787-9 for Boeing Capital Corporation and one KC-767J tanker for the Japan Air Self-Defense Force. The JASDF already operates four KC-767J tankers as well as four Boeing E-767 Airborne Warning and Control System (AWACS) aircraft. For the full-year 2018, Boeing managed to book 893 net new orders (1,008 gross orders). With 392 gross orders, Airbus boasted an impressive number of bookings in December (25 cancellations => net of 367). Four customers placed orders for a total of 251 A320neo family jets. 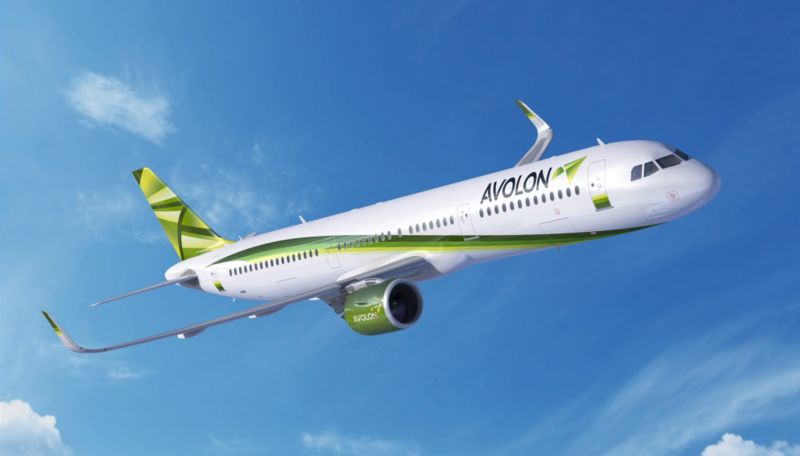 Avolon ordered 75 A320neos and 25 A321neos, while one unidentified customer placed an order for 80 A320neos and another for 50 A320neos plus 17 A321neos. Also, Airbus booked a slew of orders for its A220 model (formerly known as the Bombardier CSeries), including 60 A220-300s for JetBlue Airways and another 60 for Moxy, a new U.S. startup airline established by JetBlue cofounder David Neeleman. The firm order was preceded by a Memorandum of Understanding (MoU) signed with Airbus at the Farnborough International Airshow on July 17, 2018. Moxy’s A220s are expected to be delivered from 2021. Also in December, Delta firmed up orders for 15 A220-300s, and an unidentified customer ordered three A350-900s and one A350-1000. With 380 net new orders during the first 11 months of 2018, Airbus nearly booked the same number of orders in December alone. For the full-year 2018, Airbus landed a total of 747 net new orders (831 gross orders), thereby losing the 2018 orders race to Boeing with its 893 net new orders. Airbus had retained an orders lead over its rival every year since 2012. 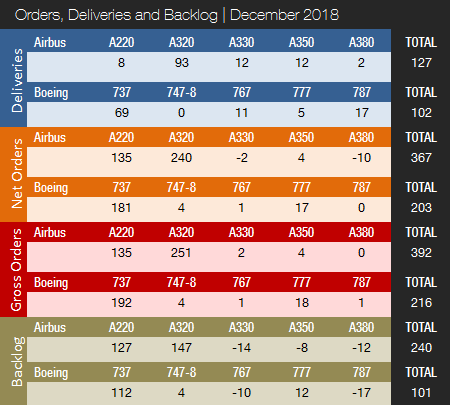 On December 31, 2018, Airbus set a new all-time order backlog record, boasting 7,577 jets on its books (of which 6,536, or 86%, are A220 and A320ceo/neo family narrowbodies). Airbus’ previous backlog record of 7,464 aircraft was set in July 2018 thanks to the addition of the A220 (formerly the Bombardier CSeries). 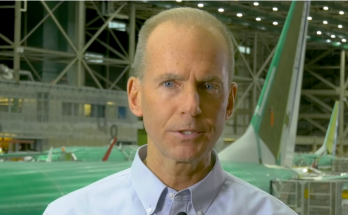 By the end of 2018, Boeing’s backlog was 5,951 aircraft (of which 4,763, or 80%, are 737 NG/MAX narrowbody jets). Boeing’s all-time backlog high of 5,964 aircraft was set in August 2018. The number of Airbus aircraft to be built and delivered represents 9.5 years of shipments at the 2018 production level. 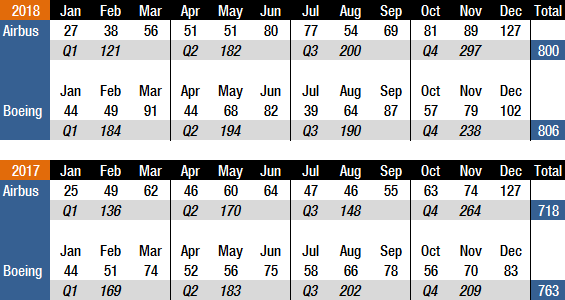 In comparison, Boeing’s backlog would “only” last 7.4 years. In 2018, Boeing boasted a book-to-bill ratio of 1.11 (0.98 as of November), with Airbus at 0.93 (0.56 as of November). In 2017, Boeing booked 912 net new orders, for a book-to-bill ratio of 1.20. That same year Airbus booked 1,109 net new orders, for a book-to-bill ratio of 1.54. Forecast International’s Platinum Forecast System® is a breakthrough in forecasting technology. Among many other features, Platinum provides 15-year production forecasts. 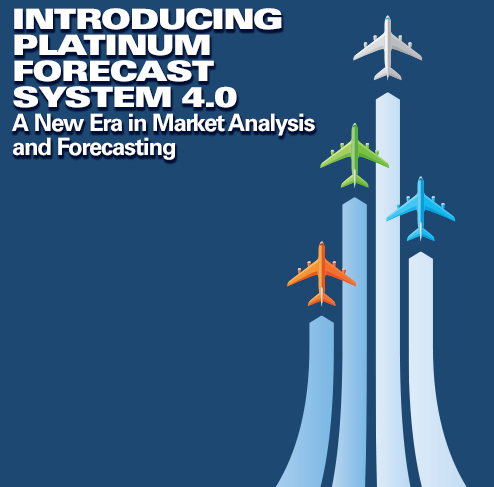 The author has used the Platinum Forecast System to retrieve the latest delivery forecasts. 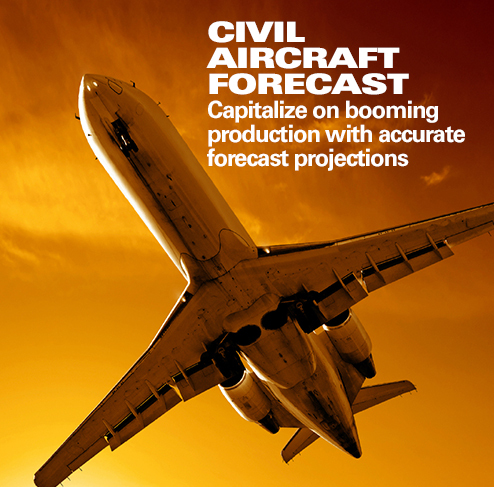 For 2019, Forecast International’s analysts expect Boeing and Airbus to deliver 870 and 862 large commercial jets, respectively. These are the latest “live” forecast figures (adjusted frequently by FI analysts as new information comes in). 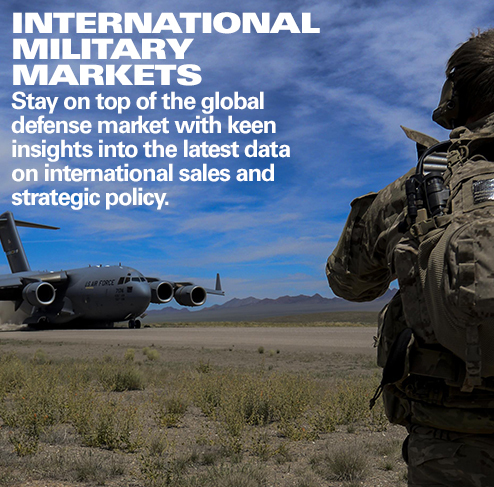 These figures exclude militarized variants of commercial platforms such as Boeing’s P-8 Poseidon, KC-46 and KC-767 tankers and C-40 Clipper and Airbus’ A330 MRTT tanker. Airbus and Boeing will provide their delivery targets for 2019 in the upcoming release of their 2018 annual results.